Today I am excited to finally be sharing a review & thoughts on one of my favorite Sephora VIB Sale Haul purchases. This is the Natasha Denona Eyeshadow Palette 5 in Color 2. Strange name I know, but there are 13 of these palettes and instead of each of them having a name, they are all numbered. No matter, the name is not important. What is very important is how amazing this sweet little palette is and why I think it's definitely worth the $48 price tag. Ouch! This palette is actually one of three Natasha Denona palettes that I ordered during the VIB sale in November. The other 5-pan palette that I ordered arrived broken and the third palette, a gift from my daughter, was returned to Sephora. That palette was the famous Natasha Denona Star Palette which retails for $169. I had hoped to review that palette on here before returning it, but honestly, it was so expensive that once I figured out it was not going to work for me, all I wanted to do was run it back to Sephora. That palette is definitely not for anyone who is newer to makeup or who doesn't know how to apply really glittery and fall out prone shadows. It was so hard to work with, even though the mattes in the palette were amazing, that I knew for the price there was no way I could keep it. This palette, is a whole other story. This palette is in fact a great palette for those of you who are looking for a little bit (or a lot) of shimmer in your life, but don't want to mess around with chunky glitter and tons of fall out. And I know you're going to say that this palette is expensive at $48 for only 5 eyeshadows. But you get a ton of product for your money and this formula is really good. Also, if you wait for the next VIB sale in April, you can score it for less. As you can see, when you purchase a Natasha Denona Palette 5 you are not paying for packaging. These palettes are very simply packaged in a white box and plastic container. One might even say that the packaging is ugly and cheap looking. I am a sucker for packaging but I think I am so excited to have this palette that the packaging didn't bother me at all and I rather enjoy the very minimalistic look of it. Plus when you look at the actual shadows in this palette, the outside becomes pretty unimportant. Look at how gorgeous these eyeshadows are and the color story of this palette is just perfection. I found that this is probably the most wearable of the 13 different palettes and this one contained all shades I knew I would use. I like a few of the other palettes, but most have at least one shade in there that I'm not a super fan of. Palette #2 has 5 shades that work really well with each other and they're shades that you can wear on the daily. 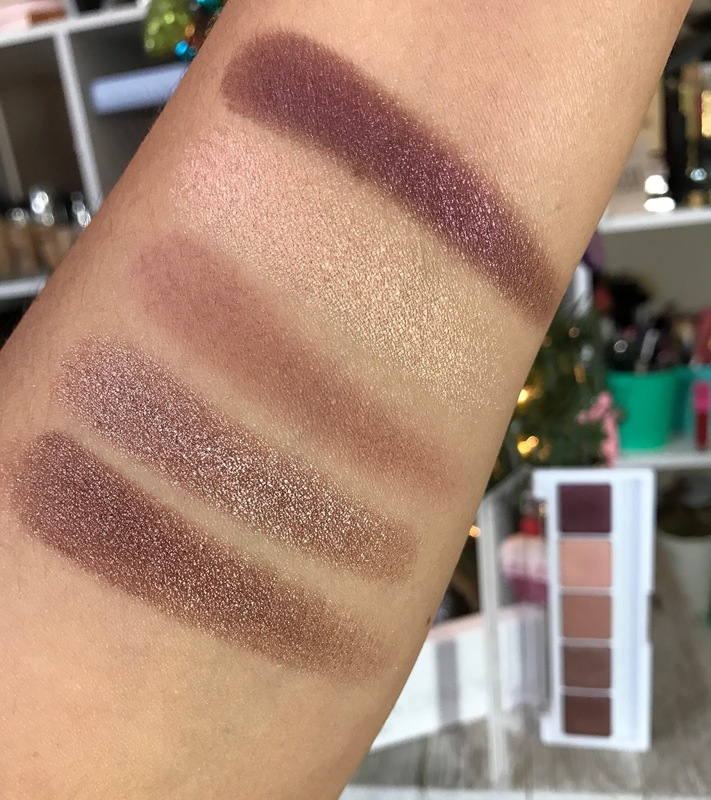 The formula of these Natasha Denona shadows are very different from other shimmer shadows I have tried. Yes, shimmery shadows are usually soft and buttery, but these are on the next level of soft and buttery. One tiny swipe into the pan and you have full pigment and the most beautiful eye look. There is one matte in this palette, that is not super pigmented when swatching, but on the eyes it build quite nicely and it really helps complete an eye look using this palette alone. For me this palette is just easy. There aren't too many shades to pick from, yet I can come up with a lot of looks using it. It's a great formula that can be applied with fingers or a brush and the colors coordinate so well together, that I don't have to be a rocket scientist to come up with a look. It's such a pleasure and so easy to use this palette that I have it at the very top of my makeup drawer. Just for the ease and great formula this palette is worth every penny. I will definitely be buying at least one more of these Natasha Denona Palette 5 palettes and I do happen to have my eye on one of the 28 pan palettes for April. Yeah, I like to have big dreams, those palettes are $239. But if it's a palette you're going use to all the time versus a $55 palette you hardly ever touch, well then it's worth the money to me.